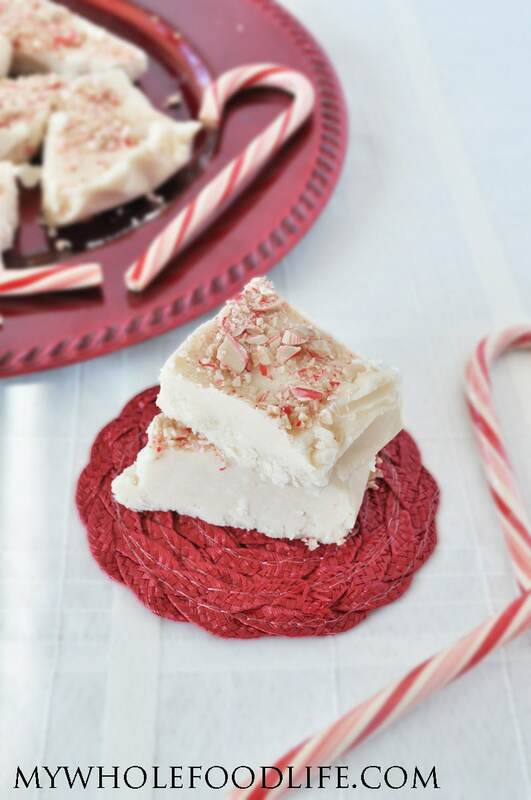 4 Ingredient Peppermint Fudge. Now that Thanksgiving is over, it’s time to start the holiday baking! What better way to do that than this 4 Ingredient Vegan Peppermint Fudge! This Vegan Peppermint Fudge is beyond easy to make and it has very little added sugar! If you enjoy healthy desserts, you may like this post as well. This 4 Ingredient Peppermint Fudge is vegan, gluten free, paleo and raw. My husband said they would also be great with a little chocolate drizzle over the top. I bet my 3 ingredient chocolate bar recipe would be perfect for that. For the candy cane garnish on these, I used these dye free candy canes . I got mine at Whole Foods, but you can probably find them at most health food stores and I will also provide the Amazon link for you. A super easy holiday dessert! Only 4 ingredients! In a food processor , combine all the ingredients. Mix until smooth. Line an 8x8 pan with parchment paper, leaving enough room to come out the sides. Using a silicone spatula , transfer the mixture to the 8x8 baking dish . Press the top down firmly. Sprinkle some of the candy can dust on top. Place in the fridge for a bit to firm up. It should not take long at all. Using a knife or pizza wheel , but into squares. Please keep this fudge stored in the fridge. It should last several weeks that way. You can also probably freeze it for longer storage. Enjoy! Every time I try to blend coconut butter in a food processor it gets really crumbly and never really smooths out, even if I warm up the jar ahead of time. Am I doing something wrong here, should I try a different brand...? Mine sometimes does that too. That is why I add the milk in this recipe. It helps smooth it out. Sometimes I just add a bit of coconut oil... seems to help a lot! Can I find Organic or clean candy canes somewhere else other than amazon? Central market? whole foods? sprouts? Yes! Whole Food and Trader Joes should have them as well. I found organic candy canes at Meijer. My oh my! It's like Christmas in a bite! Would using a pure peppermint essential oil work instead of peppermint extract? I cannot have anything with alcohol in it. I can't wait to try this recipe.. but then I love all your recipes! YUM. Thanks Mary! I am not familiar with peppermint essential oil. Is it one you can digest? You may be able to find an alcohol free peppermint extract. I was sitting here reading this thinking that I would use my Peppermint oil instead of extract! Yummy, I love fudge this time of year! You can't beat peppermint, thanks for the recipe! Does it have to be coconut butter or can I use real butter? Real butter may work. If you try, please let me know the results! Just for the record, you can't taste the coconut. All I could taste was the peppermint in these! So interesting to see fudge with no chocolate.. I'm intrigued. Thanks Shelly and thanks for pinning! Hi Melissa, I love your blog and all your recipes! I recently started my own lifestyle/ food blog as well, and I'm currently working on a post where I'm sharing some holiday recipes. I was wondering if it was okay to feature this one in my post, by using one of your pictures and linking it to here. I will of course give you all the proper credits. Please let me know, thanks! Hi Rachel! Thanks so much for asking. :) You have my permission. I do not have a Food Processor so can I use my KitchenAid to make this?